Come play with us! We promise you will have fun! The next time you visit Play All Day, you will notice some changes in the lobby. My wonderful purple chair has been moved to make way for something that I am very passionate about…. quality dog food. For the past year, I have debated on whether or not to jump into selling dog food. I knew it would be a great convenience for our daycare clients, and I knew it would be a great opportunity to educate pet parents on quality nutrition, but what kept stopping me was an uncertainty over whether I could offer a wide enough variety at a good price point. To help me make a decision, I recently made a trip to a quality dog food store in Bloomington, called The Urban Carnivore. The owners, Kathy and Sally, greeted me with open arms and put to rest my fears about not being able to provide enough. They convinced me that by just taking a few small steps initially, I could still impact the lives of Play All Day dogs in a positive way. So I am dipping my toes into the retail waters just a bit further now. 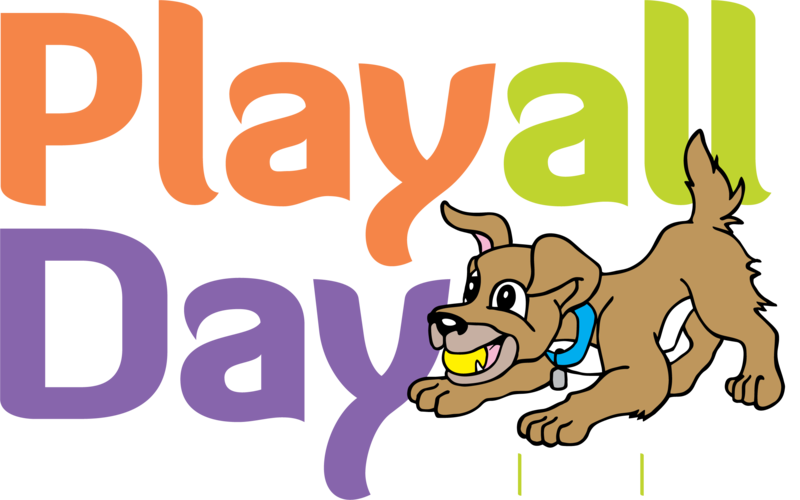 In addition to a limited line of toys and treats that I believe in, Play All Day will now offer quality foods at good price points. And free of charge, I plan to share what I have learned over the years so that you can help your dog lead a healthy life. My passion over dog nutrition began when my first Golden Retriever, Rane was diagnosed with severe allergies in the early 90’s. This poor boy spent most of his life itching, and was polluted with steroids and antibiotics to make him more comfortable. They helped him feel better and decreased his itching, but the long term effects most likely contributed to his early death due to leukemia. I am so grateful for the wonderful care of my veterinarian who always had his best interests at heart, but I knew that there was some link to his short life and the diet he consumed. So began my quest to understand what dogs need from their diets. The internet overwhelmed me with every opinion under the sun on raw home prepared diets, premium, super premium kibbles, dehydrated raw diets, and on and on. My mind works best with facts. Every person out there with a computer and an internet connection can put their opinion out and it is so difficult to really understand what is real and what is not. I eventually gave up and just hoped that I would not have another dog with allergies. When Graham began to show signs of allergies several years ago, I booked an appointment with Dr. Karen Becker in Bourbannais. Dr. Becker is an incredibly talented and well respected proactive veterinarian who specializes in nutrition and allergies. What I learned from her has changed the way I feed my dogs and has changed the advice that I give others about feeding their own dogs. Diet can and does make a difference for your dog. Sometimes that difference is very obvious and can be seen in a short time and sometimes it is subtle and may not manifest for many years. 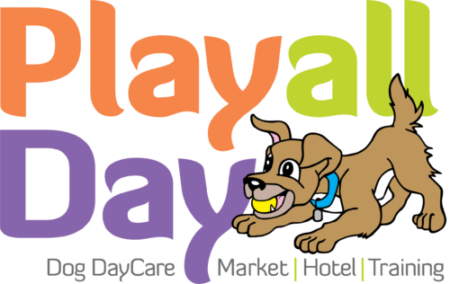 I am in a very interesting position as the caretaker for Play All Day dogs. I see the food that is brought in when a dog comes in for a hotel stay. I see the results of that food when we clean up dog poop all morning long. My hands are on the dogs throughout the day and feel the quality of the skin and coat. And my nose smells the dogs throughout the day. All of these things give me information about what the dog is being fed and how he is reacting to his diet. And I also see how much all of my dogs’ guardians love and care for them and how willing they are to invest time and money into their beloved dogs. So I am always surprised when I see low quality food being fed. I know that it is not because the guardian does not want the best for their dog, but can be because the guardian does not understand the effect that diet has on a dog’s overall health. But most often it is because the marketing for dog food is so brilliant that most dog owners are tricked into believing that they are feeding a high quality food. And the dog food industry is always changing. Dog foods that were of great quality a few years ago may have been purchased by big companies and ingredients/quality of ingredients slowly changed over the years to decrease production costs, and now that once premium food is now mediocre at best. So how are you to choose, given all this conflicting information? Never fear. It is not hard. You can trust me to educate you and make recommendations. Or better yet, you can educate yourself and make great decisions on your own. If you are willing to devote 30 minutes to watch the two attached videos, you will know most everything you need to know to make good decisions regarding dog food purchases. I have also attached a link to a website that does non-biased reviews of dog food and can aid you in your decision. My commitment to you is to give you information regarding your dog’s elimination habits, my opinion of his coat quality and behavior, and to answer any questions you may have. I also commit to offer products, whether it be food, toys, or treats, that I would give my own dogs. I did not open a daycare to sell retail items. I sell retail items to enhance the lives of my daycare dogs.